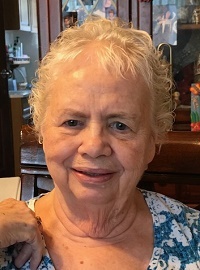 Sherry A. Bugg, 82, passed away 7:01 am, Sunday, September 30, 2018 at her residence. Born in Wood River on March 12, 1936, she was the daughter of James R. and Zayda (Barrick) Anderson. She had worked as a unit clerk at Wood River Township Hospital for 29 years before retiring. On November 21, 1953 in Carlinville, she married Walter Bugg. He survives. Surviving also are a son, Robert (Marsha) Bugg of Brighton; daughters, Brenda (Kevin) Oseland of Wood River, Barbara (Owen) Wheeler of Troy, Becky (Kevin) Tucker of Brighton; 11 grandchildren; 14 great grandchildren; brother, John Anderson in Arkansas; half-brothers, Jerry Starkey of Joliet and Quint Starkey in Missouri; sisters, Sannatte Taylor of Hazelwood, MO, Judy Mullins of Wood River, and Margie Anderson in Arkansas. Her parents; brothers, Larry Starkey, James Anderson, Bob Anderson; and sisters, Freida Anderson, Betty Lewis and Virginia Nader preceded her in death. Visitation will be from 4-7 pm Tuesday at Marks Mortuary in Wood River where services will be held at 10 am, Wednesday. Burial will follow in Upper Alton Cemetery. Memorials may be made to St. Jude Children's Research Hospital.